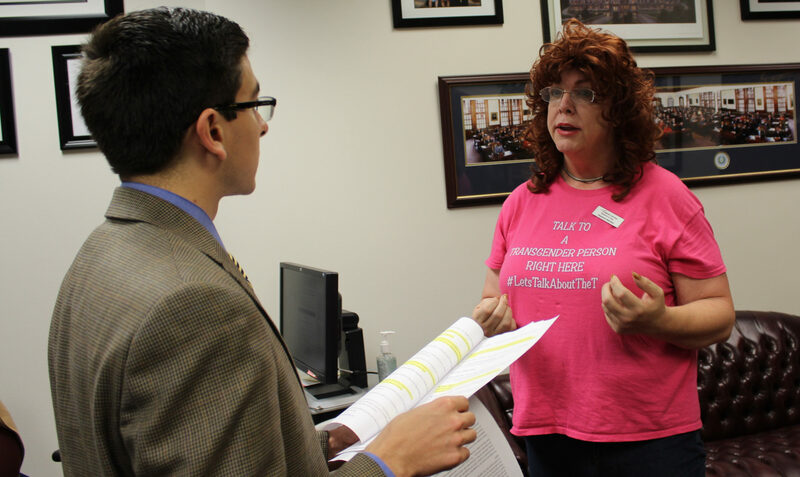 Sporting what she calls her “visibility T-shirt” — emblazoned with “TALK TO A TRANSGENDER PERSON RIGHT HERE” — Martinez began Monday morning by making follow-up visits to the offices of Lucio and Senator Lois Kolkhorst, R-Brenham, the author of SB 6. Martinez wanted to drop off a letter she wrote this weekend in response to reports that one day after final Senate passage of SB 6, Kolkhorst helped Lucio obtain a $5 million budget rider for a project in his district, raising questions about whether she did so in exchange for his support of the bathroom bill. “I feel kind of like we were sold,” Martinez said. Also on Monday’s agenda were visits to the offices of Senators Donna Campbell, R-New Braunfels, and Don Huffines, R-Dallas, both staunch supporters of SB 6. In Campbell’s office, Martinez quizzed staff members about the senator’s statement during debate on SB 6 that schools and other government entities would make reasonable accommodations for trans people in public buildings. Martinez is among the vast majority of trans Texans who haven’t updated their birth certificates to reflect their gender identity, meaning Martinez would be forced to use the men’s restroom if SB 6 passes. “That’s a good question,” one of Campbell’s staff members responded, before pledging to get back to Martinez with more information. Though she met with only a few lawmakers in person, Martinez reported mostly positive interactions with their staffs. She said one notable exception was an aide to Lieutenant Governor Dan Patrick, who’s championed SB 6. “He didn’t say anything mean, but it definitely had an antagonistic tone,” Martinez said. After concluding her tour Monday morning, Martinez joined several hundred other LGBT people and allies for a lobby day rally at the Capitol headlined by actress Sara Ramirez. Sara Ramirez from the hit TV show “Grey’s Anatomy” speaks during Equality Texas’ lobby day at the Capitol on Monday. Chuck Smith, CEO of Equality Texas, said nearly 1,000 participants registered for this year’s lobby day, more than twice as many as in 2015, an increase he attributed mostly to SB 6. Smith said that SB 6 is just one of 25 anti-LGBT bills under consideration, up from 23 last session and the most in the history of the Legislature. The vast majority of those bills would allow discrimination against the LGBT community based on people’s “sincerely held religious beliefs,” and Smith said he’s “extremely concerned” that one or more of them could pass. “I do believe that ultimately it will be easier to kill SB 6 than it will be to kill some of the religious refusal bills,” Smith said. Marty Rouse, field director for the Human Rights Campaign, the nation’s largest LGBT advocacy group, said the key to defeating “bathroom bills” in Texas and other states is for trans people to become more visible, and for LGBT advocates to raise awareness about the discrimination they face.